The City of Valletta is an ideal Renaissance city founded by the Knights Order of St. John of Jerusalem. It was founded in 1568. The Order ruled from here for 2.5 centuries and created a late Renaissance city within city walls to withstand the Turks. The city has preserved this original features very well. Valletta was named after Jean Parisot de la Valette, a French nobleman who had joined the Order of St. John. 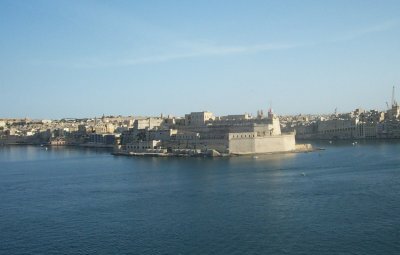 The city of Valletta is one of the early WHS (1980), usually a good omen (together with matching criterium 1, masterpiece of human creative genius, which Valletta also does). Only 7000 people live here, in this fortress-city. The early evenings I found the best time to roam around this city's streets. It's cooler and more quiet then, and the shade and the descending sun do some marvellous things with the narrouw streets and the monumental houses. One thing not to be missed is the Cathedral. Not too spectacular on the outside, but with an amazing interior. 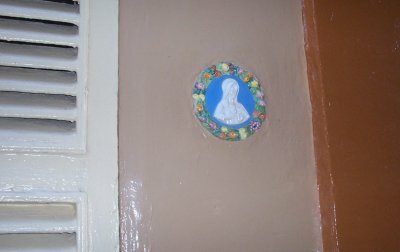 Every wall and pillar is decorated with thick, curly ornamentation. Its floor consists of elaborately painted marble gravestones. I went to Malta on a last-minute whim over New Year 2014/15. After a lovely fireworks display at midnight, the weather was terrible on 1st Jan - raining all day. We managed to explore the small city of Valletta when the sun came out over the next few days, basing ourselves in an Airbnb apartment right in the centre. Valletta is south of two African capitals: Tunis and Algiers – making it one of the most southerly reaches of Europe. It has a fascinating history, having been ruled by a who's who of civilisations since Antiquity. St John’s Co-Cathedral was a highlight for me, notable for housing two of the finest paintings from Caravaggio’s oevre. The Beheading of Saint John the Baptist is said to be the first depiction of a ‘tragedy’ in post-Classical art. On a different note, I regret to inform Paul Tanner that Malta's buses are no longer so characterful - they have been replaced by boring green Arriva buses of the sort you might find in Wales. I've been going to Malta for 30 yrs and I still haven't seen all there is to see in Valletta, the buildings and it's remarkable history are phenominal. I marvelled at the sheer size of the fortifications, the beautiful architecture. I could go on forever but if you like historical places then this is a must. I first went to Malta because my father was there during WW11 so I traced the places he had described to me and fell in love with the place. St. John's Cathedral was built when Malta was often attacked by corsairs, therefore "a siege mentality" pervaded the island. So the cathedral's plain facade was a sign of the times - have the facade ready as quickly as possible and then. with doors safely closed continue building and embellishing the interior. St. John's co Cathedral is the result. I used to live quite close to this WHS. I believe Valletta, Malta's capital city, is a treasure trove of history and culture built by the Knights of St. John. The natural harbour with its fortifications and bastions are best seen from sea preferably with the smaller boats known as Luzzu or Latini boats which are ideal to go deeper in all the creeks. Don't miss Caravaggio's Beheading of St. John in the Cathedral and the magnificent view overlooking the Grand Harbour from the Upper and Lower Barrakka Gardens. Valletta has only 6,000 people and is the EU's smallest capital city, but it makes up for that with a huge number of great buildings and fortifications unmatched by much larger cities. The best sight is St.John's Co-Cathedral - unremarkable from the outside, but pure Baroque splendour on the inside. Other interesting sights include the Grand Master's Palace, the Upper Barakka Gardens, the Archaeology Museum and the two harbours on each side of the peninsula Valletta occupies (a harbour cruise is not to be missed). The city is so small that all sights can easily be reached on foot, but it can still take quite a while, because on any given day, thousands of cruise-ship passengers crowd the streets. Valetta was the first stop of our 7-day Mediterranean Cruise. While on the ship, we were advised to wake up early before it docks on the port because it is the most wonderful scenery during the trip. I was so glad I did. Just before sunrise, I positioned myself to a very vantage point on the upper deck to discover a sight never seen before. It was really magnificent as we approached the port and although I took a lot of pictures, I can still visualize in my mind the very wonderful sight I saw. And that was just the beginning. Although we didn't go very far, our stopover was well worth it. We were supposed to do a city bus tour but we ended up hopping into a cab and asked to be taken to the bus station where we came to a very good place to start our walking tour. It was a holiday then and school children were out with their parents. Just walking around gave us a lot of pleasure seeing the locals and lots of tourists as well. Plenty of shopping opportunities but I opted not to spend on anything. On the way back to the ship, we walked exploring the steep steps going down. We didn't have enough time to go inside the St. John's Cathedral, but what we saw was enough to wet our appetite to see more next time we decide to tour this place again. 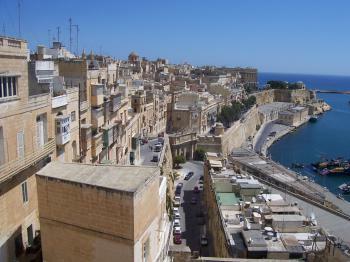 Like many tourists, we first reached Valetta at its bus terminus just outside the city gate. Maltese buses are (were?) wonderful decorated and lumbering creatures but the diesel fumes, noise and general chaos did not seem to augur well. However, once through the walls, we found a delightful place. It is of an ideal size for exploring on foot, (but be ready for the “streets of steps” – it is rather hilly). Almost every building seems “old” albeit that many appear to need a bit of tender care and restoration!! 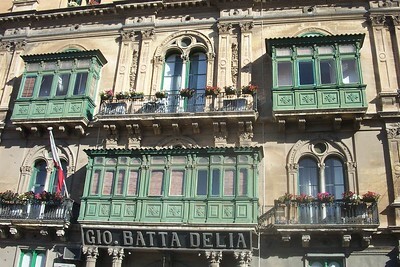 Many have stone or wooden balconies which are typically “Maltese” and differentiate this city from others in the Mediterranean. The city’s position on a promontory between 2 arms of its wonderful harbour provides great views. We visited it on a short stopover on the way to/from Libya and it had to compete with the all other sights of Malta in 2 full days. Often we feel that we have given a city too long but just over half a short winter’s day was, unfortunately, not enough in this quite small city – we didn’t even have time for a harbour cruise or to visit the museum. As a result it joins my list of cities which I don’t feel I adequately explored but which, regrettably, are in locations which, given all the other places to see in this world, don’t have enough other attractions to take us back – perhaps in later retirement! The small capital of Malta is a great place to visit and I was happy to make this World Heritage Site visit number 100! The city sits at the end of a peninsular and is enclosed in impressive fortifications. We spent four nights here using it as a base for exploring the country via the unique bus service. The city itself is uniform and surprisingly hilly with streets of steps a regular feature, St Ursular’s Street is perhaps the nicest and contains the thoroughly recommended Asti Guesthouse. The tall buildings are quite uniform however there are a few lovely façades especially on the Auberge de Castille. On the whole Valletta would be a nice site, however it does have two magnificent features that really warrant a visit. Firstly there are the Gardens dotted around the extremities of the city. The most impressive are the Upper Barakka Gardens, which overlook one of the greatest natural harbours of Europe. These are a great place to just sit and relax and soak up the great panorama. The Hastings Gardens on the opposite side of the city are also worth a bit of time and offer nice views of the fortifications. The most impressive thing in Valletta however is St John’s Co-Cathedral, as said elsewhere on this page the outside is nothing special, however the interior is spectacular. It is reasonably small but it is perfect! Baroque decoration covers every surface and the floor rightfully claims to be the most impressive in the world, it is covered in incredible memorials to the Knights of St John. This would be enough however the Cathedral contains one more undoubted masterpiece in the shape of Caravaggio’s ‘Beheading of St John the Baptist’. Truly an exceptional Cathedral and one not to be missed, despite the entrance fee. These two world-class attractions, coupled with a lovely centre and two more World Heritage Sites in the suburbs make Valletta well worth a few days of anyone’s time. 2.0: Stanislaw Warwas Peter A.
Knights Hospitaller: Finally kicked out of Rhodes in 1522 the Knights Hospitaller wandered Europe for 7 years looking for a home and were granted Malta in 1530 by Charles V of Spain as King of Sicily (They had to pay a Falcon annually - hence the "Maltese Falcon"!). Valetta itself was built after the Ottoman seige of 1565 was successfully resisted. Time Balls and Guns: Saluting Battery Barracca garden. Now only on Saturdays at noon. Queen Victoria: Statue of Queen Victoria situated in"Republic Square"! 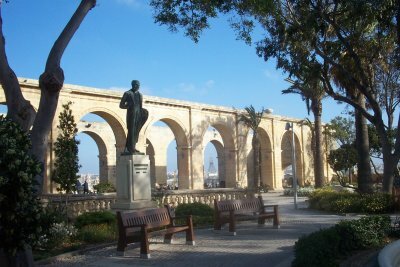 Fatal Accidents or 'disasters': Carnival tragedy of 1823: a human crush which occurred on 11 February 1823 at the Convent of the Minori Osservanti in Valletta. About 110 boys who had gone to the convent to receive bread on the last day of carnival celebrations were killed after falling down a flight of steps while trying to get out of the convent. 336 Community Members have visited.